This is Olivia & Effie from 2011 Chrysalis Collection. Hand painted by Helen Kish. 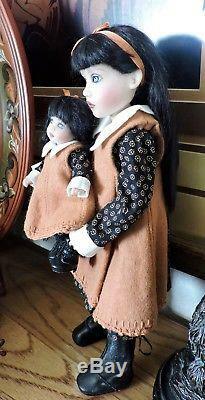 Both dolls are signed on their lower back by Helen Kish. Olivia is 12" tall and Effie is 5" tall. 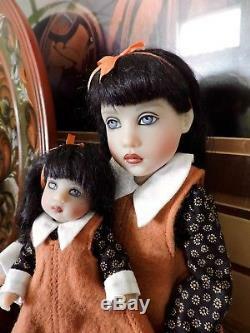 Both dolls have been in a glass curio , out of sunlight, and will come with certificate, box & shipper. 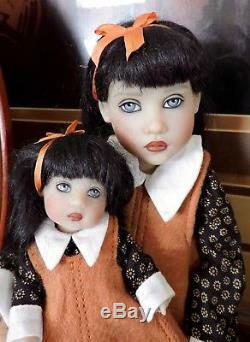 I take very good care of my dolls & they are rarely handled. From my SMOKE FREE home. And I'm having a hard enough time just parting with any of my dolls. The item "OLIVIA & EFFIE 2011 Hand Painted by Helen Kish #42 SIGNED Org BOX COA" is in sale since Wednesday, May 9, 2018. 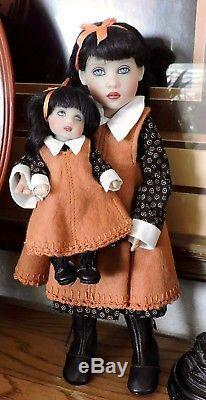 This item is in the category "Dolls & Bears\Dolls\By Brand, Company, Character\Kish". The seller is "anderscollectibles" and is located in Albuquerque, New Mexico. This item can be shipped to United States.